Indio barbecue master dons his apron this year at Indio California State BBQ Championship and Festival. (From left) Indio 2015 Mayor Lupe Ramos Watson stands by 2015 Grand Champion Daren Warth, 2015 organizer Thom Emery and current Indio Mayor Glen Miller. No sitting on the sidelines this time. 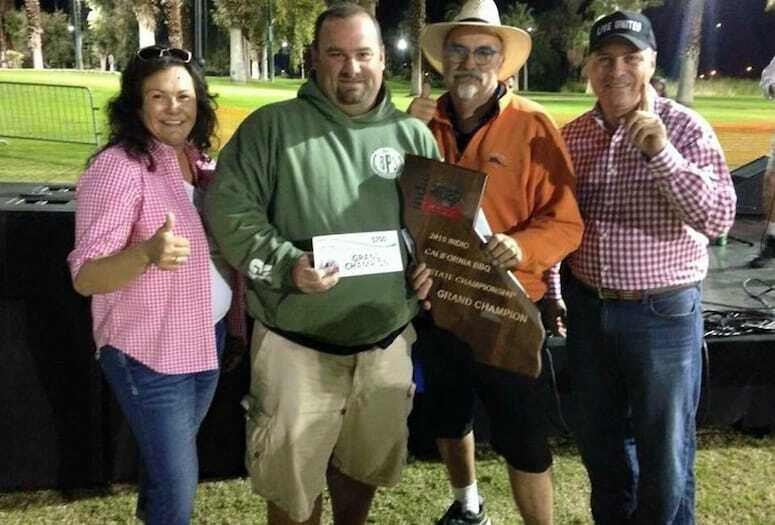 Thom Emery sat out last year’s inaugural Indio California State BBQ Championship and Festival because he was prevented from entering as the event organizer. He’ll be cooking for the second annual Nov. 12 at The Lights at Indio Golf Course. The competition is part of a slew of events under the Coachella Valley Beer Week moniker, which runs Nov. 11-20. Last year over 6,000 guests tasted some of the most succulent and delectable barbecue choices with purchased plates from participating contestants. Craft beer selections will also be available for purchase in the Coachella Valley Beer tent. The barbecue competition showcases state and national contenders in a battle of Pro BBQ Pitmasters and is a sanctioned event certified by the Kansas City Barbeque Society. Contestants will vie for a prize purse and the title of Grand Champion in several grilling categories including chicken, pork ribs, pork shoulder, and beef brisket. There is also a “locals championship” amateur class round for participants who are not pro barbecue pitmasters but are boss backyard grillers. Emery will pit his skills up against a world-class field of grillers including Iowa’s Smokey D’s, led by Daren Warth, who won the Jack Daniels World Championship BBQ Competition, the American Royal BBQ World Championship Competition, the Kingsford Invitational and was the 2015 Indio Grand Champion. He will return to the desert to defend his title against approximately 50 expected pitmasters. Emery will put his talents to the test by using a “hot and fast cooking” method which cooks at a high speed over 300 degrees. “It might sound crazy but we don’t use a typical ‘low and slow’ technique,” he says. “We used to stay up all night and it would take 14 hours. Now, I’m cooking and it takes about 5 hours…and it’s working! The only problem is that if you make a mistake, there is no fixing it. But if you hit it right…it’s great!